This Little Free Library, #26048, is in right off SE Woodstock, in the low 40s. It’s right near Otto’s Sausage Kitchen & Meat Market and Laughing Planet. Another lovely little neighborhood with access to some great neighborhood businesses. The LFL definitely matches the house, and they painted song lyrics on the garage door. Neat! I made sure to note it in the Little Library Locator. 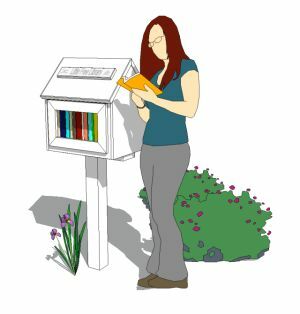 Hey, did you notice that the Little Library Locator’s background changed right after Halloween? It’s kind of a nice touch.